Gyotaku is the art and technique of Chinese fish rubbing, a process derived from an ancient printing method used before photography or taxidermy were invented. The first Gyotaku were done to preserve a true record of the size and species of fish caught by fisherman. The oldest fish prints known, preserved in a museum, date back a century. Is an actual fish used? Yes. 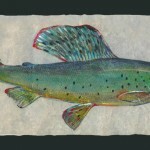 After the fish is wiped off to carefully remove the slimy film, an oil base ink, watercolor or acrylic is applied directly to the body surface of the fish. Many different materials are used to make the rubbing, but I use an elegant hand-made mulberry rice paper. The hand-made paper is placed over the fish and the outer surface of the paper is gently rubbed by the fingers or the hand. The paper is then carefully separated from the fish body and a fine impression of the fish is obtained. I then hand paint bits of color and detail directly onto the rubbing. Where do you get the fish you print? I have been an avid fisherman all of my life and catch the vast majority of the fish myself. I live on Old Hickory Lake in Gallatin, Tennessee which provides me with a constant source of fish to be used for rubbing. I also travel extensively doing art shows, and I rarely miss an opportunity to fish where ever I happen to be. In the summer of 1998, I spent the month of August remote fishing and camping in Alaska. It was truly the experience of a life time for me, and I hope to return. As my rubbings are collected by more and more people, the collectors themselves have provided me with fish from Alaska to the outer banks of North Carolina. Their reward is to become the owner of the first rubbing taken from the fish! How many rubbings are made from one fish? If the fish is durable and lends itself to printing, many rubbings may be taken. Understanding of fish structure and its ecology is vital to successful rubbing. Because I am a fisherman and an artist, I am able to render accurate and true rubbings. Starting with a strong knowledge of my subject, and being an artist, allows me to take artistic liberty when I print while remaining true to my subject. Do you share your knowledge of this technique with others? Yes, I do. Children especially enjoy the hands- on approach to fish rubbing and learning about fish. I have taken my fish to schools and day care centers. With groups of children, I usually use T-shirts as the medium on which we print. That way, at the end of the day, each child has his own fish rubbing shirt to take home and show off to his family! My rubbings have been accepted into many juried art shows and invitationals. They have been the subject of several interviews and articles appearing in newspapers and magazines, and are exhibited at the Myrtle Beach Aquarium, The Tennessee Aquarium and the private collections of numerous companies and individuals.